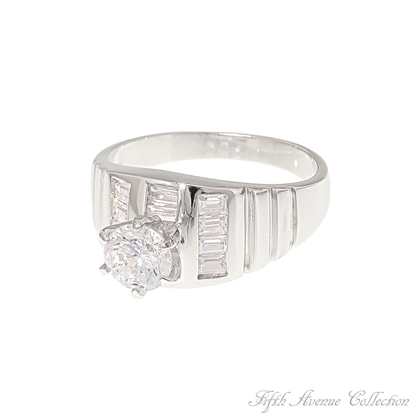 A single row of jet cubic zirconia is enhanced with two stunning rows of sparkling clears. 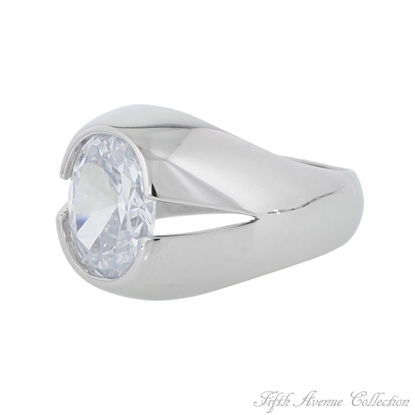 A brilliant combination for this rich and durable stainless steel ring finished in rich rhodium. Sizes 5 to 12Nickel, lead and cadmium free. 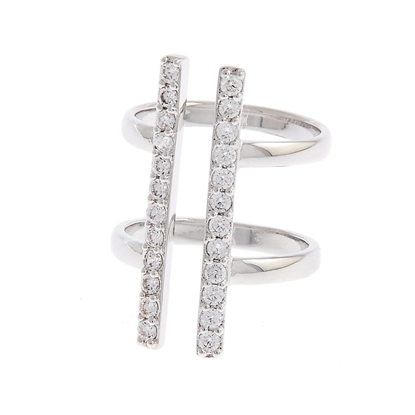 Get "Back in the Game" wearing the latest look in jewellery. 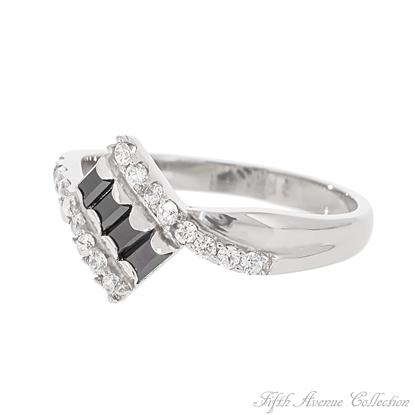 This high polished stainless steel ring, designed with a strip of black is crowned with five brilliant AAA cubic zirconia. Nickel and lead free. 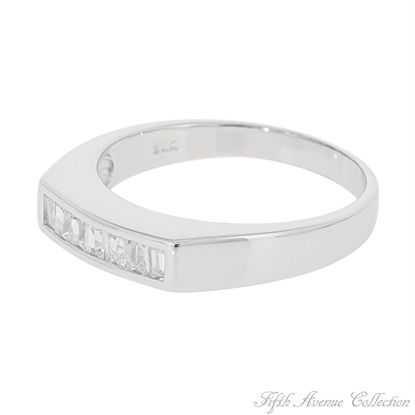 “Beauty is...” this dazzling ring featuring over a dozen aurora borealis cubic zirconia finished in your choice of rich rhodium or gleaming gold. This glamorous design is sure to add some sass to your favourite party dress or your daily office attire.Sizes 5-12 in Gold.Sizes 5 & 10-12 in Rich Rodium. 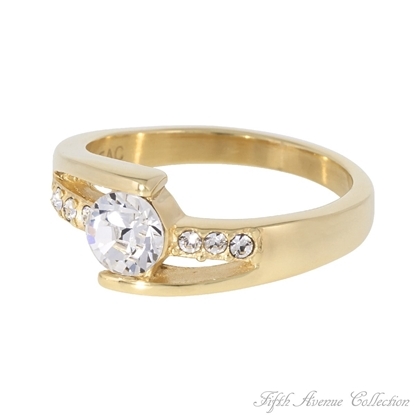 The crown of this simple yet striking design features seven baguette cut Triple A quality cubic zirconia in a channel setting.Beautifully finished in your choice of gold or rhodium, Champagne and Roses #2 may be worn with your favorite ring or paired with its match, Champagne and Roses #1.This enchanting design is beautiful on any hand. 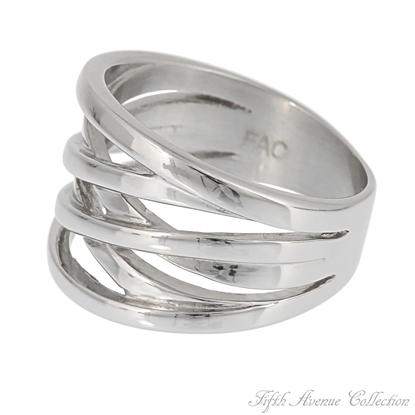 Cause a stir in the crowd wearing this knockout ring, but be careful… they may expect you to say “Cheque Please”! 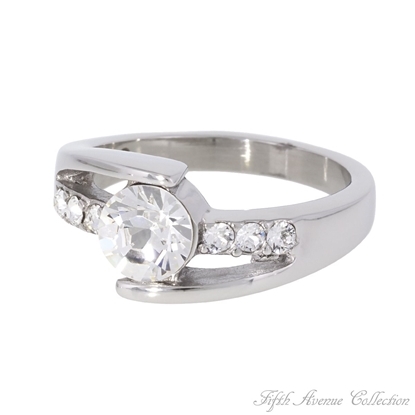 There are seventy eight AAA cubic zirconia set in this gorgeous sterling silver ring finished in rich rhodium. Sometimes a girl just has to keep them guessing.Sizes 5 to 10Nickel and lead free. 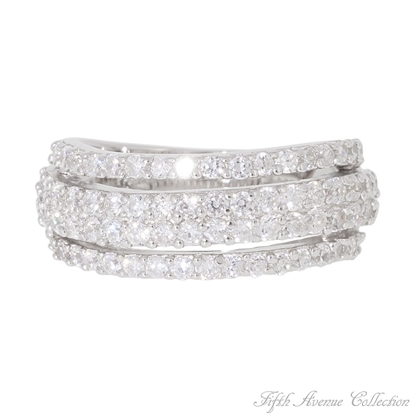 You’ll be “Circled With Love” and admired for your great fashion sense wearing this stunning ring with over 20 shimmering triple A quality cubic zirconia. Designed especially for all the lucky ladies who were born in April! 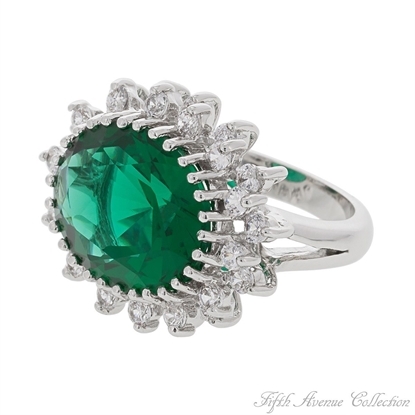 A combination of Swarovski green emerald crystal and rows of sparkling triple A cubic zirconia are brilliant in this wide band ring finished in rich rhodium. "Cleopatra's Gem"... inspired by history, its femininity and mystery create a passion for ownership. 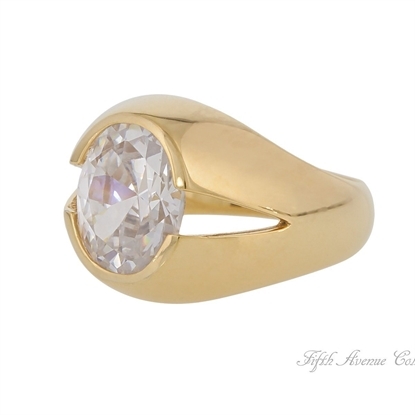 The stunning beauty of a sun drenched summer rose, the colour of fine sparkling wine is captured in this romantic ring.The latest cut and colour found in this beautiful cubic zirconia is selected to be the rage of the coming fashion season. 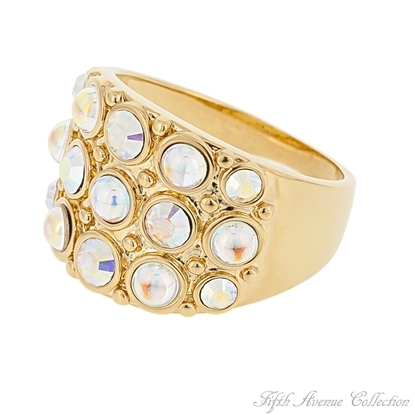 Finished in gold, "Crackling Rose" is the perfect accessory to add extra sensation to your style! 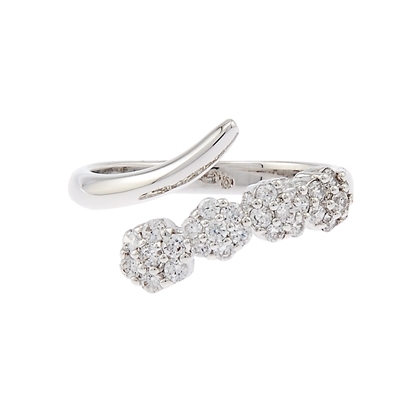 Add instant effortless style and glamour to your look with our new asymmetrical “Dainty Curves” ring. 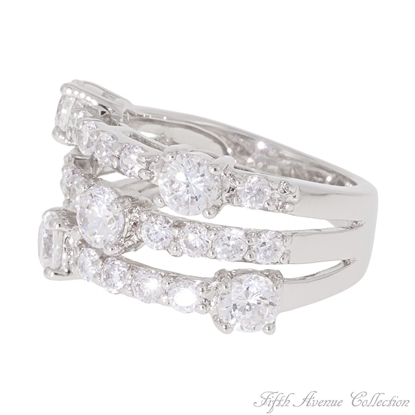 Showcasing a beautiful frill of flower shaped AAA cubic zirconia in a rich rhodium finish, this ring is sure to grab attention. 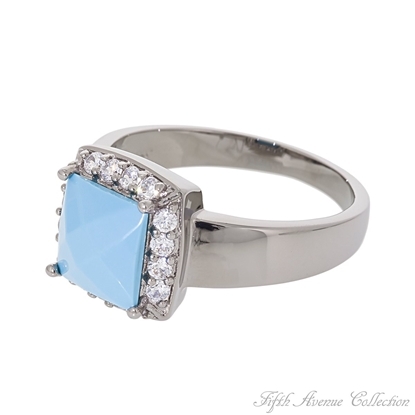 A square cut multi-faceted turquoise stone set in a subtle hematite finish and surrounded by 12 brilliant top quality cubic zirconia is extraordinary in its look. If unique jewellery is your pleasure, then this ring was designed especially for you.Available in sizes 5 & 10-12. 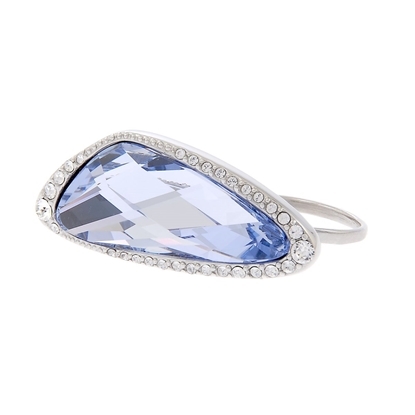 Since time began topaz has been treasured for its beauty and symbolic meaning of hope, happiness, and faithful friends. The most significant role of this vibrant stone is that it's recognized as November’s birthstone. 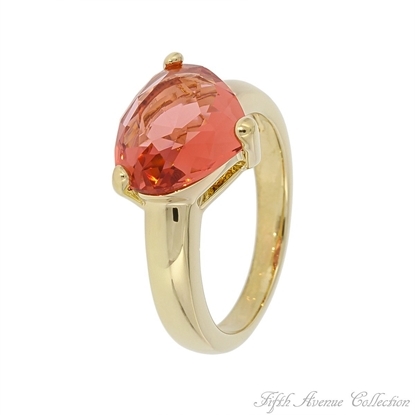 Fifth Avenue Collection captures its fiery brilliance in jewellery that was "Designed for You". 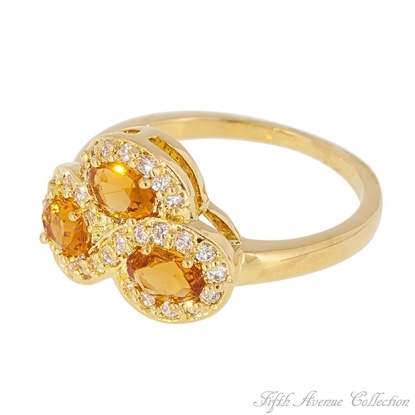 A vibrant show of three fiery triple A quality topaz cubic zirconia surrounded by thirty brilliant clears enhance the rich gold finish.Sizes 5–12. 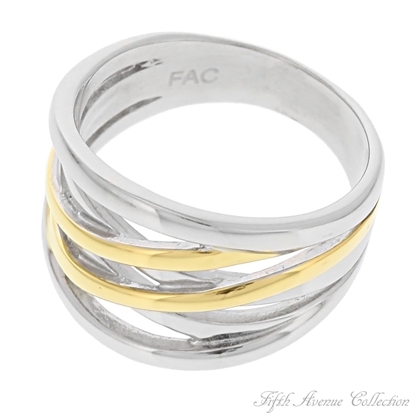 Simplistic style is evident in this attractive stainless steel ring with a unique basket-weave design. Nickel and lead free. 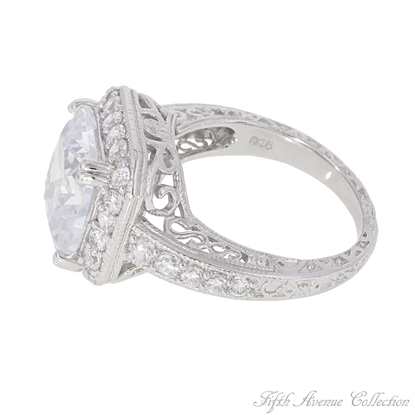 Simple, elegant sparkle finished in rich and durable rhodium, our "Double Luxe" ring is the picture of radiance. 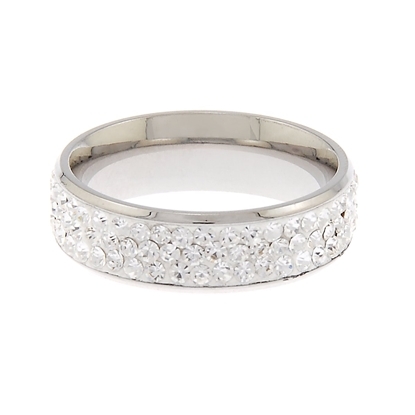 Eye catching Swarovski crystal sets this stunning stainless steel ring apart with pure elegance. 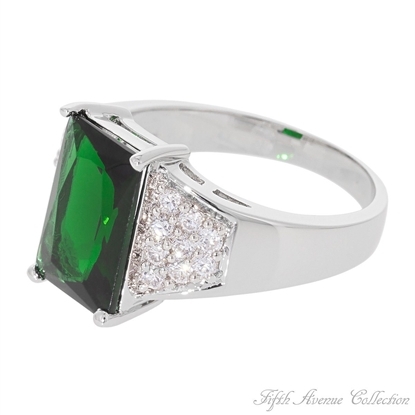 The divine colour of rich emerald found in this gorgeous ring is radiant with light and energy. 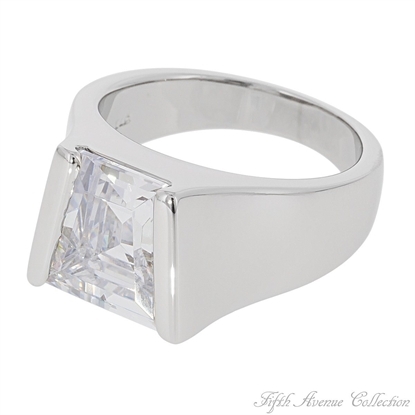 An extra large princess cut top quality cubic zurconia is surrounded by the brilliance of 28 blazing clears...set in rich rhodium this brilliant treasure is worthy of royalty. 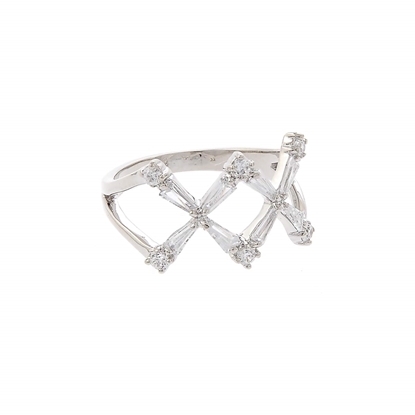 Fifth Avenue Collection takes pride in bringing you only the finest in fashion jewellery so you may experience a lifetime of beauty and exquisite style; that’s why our latest ring selection includes Eternal Luxe. 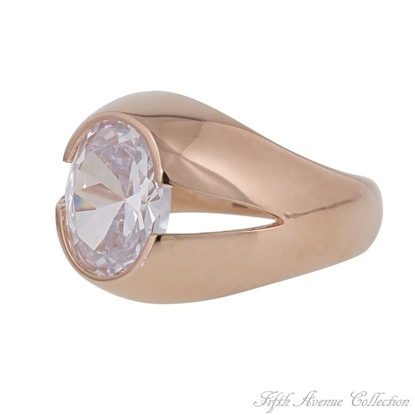 With luxurious glamour featuring a dual row of clear Swarovski crystals encircling a deluxe stainless steel band finished in rich rose gold, this ring offers the very best in refined, timeless fashion. 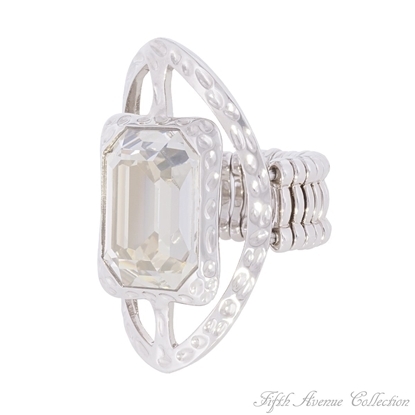 Elegantly edgy, our double-finger "Fashion Rebel" ring is statement chic. 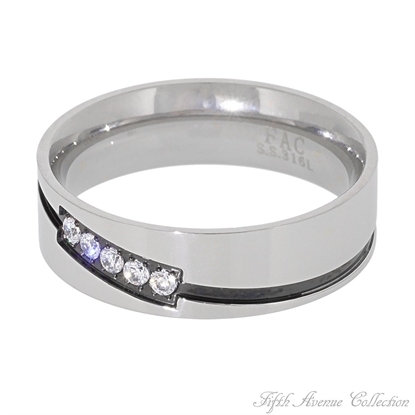 Its romantic tanzanite-hued Swarovski crystal centerpiece is complemented by a stunning border of blazing clear rounds and stainless steel setting. Versatile for everyday wear, the "Fashion Rebel" transitions from day to night and season to season seamlessly.